From the great line of Baby Hazel games comes Baby Hazel Farm Tour where Hazel discovers her uncle’s farm for the first time. This game is made for developing skills in young children with colorful graphics and entertaining animations. It is sure to entertain a young one with it’s simple story and easy gameplay. By watching on the screen for hints about what the characters want to do in the game they will learn what to do next. To play all is needed is the use of the mouse to interact with the items in the game and the characters as well. Young children that also have an interest in farm animals of any sort will get a real kick out of this game. In this Baby Hazel game you play as the character of Hazel on an adventure to a farm. While at the farm you will get to interact with all different types of farm animals by bathing and feeding them. You will also have to keep Hazel happy by interacting with the environment in certain ways. When a thought bubble pops up on one of the characters it will give you a clue about what to do next. By clicking and dragging the item desired to the character it will raise their happiness and move you closer to winning the game. By finishing all of the tasks given and keeping the happiness meter up you can gracefully keep all of the animals fed and clean. 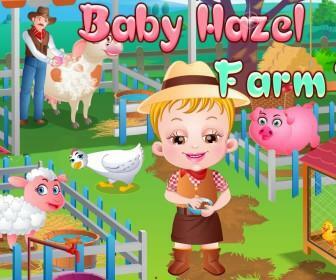 Baby Hazel Farm Tour is a great game for young children that want to learn more about the responsibilities of taking care of farm animals. From sheep to cows a young child will learn that it takes a little work to take care of these adorably animated animals. Plus with colorful graphics and an easy to use interface they will have a great experience working through all of the challenges that this game presents. They will also learn more about what it takes to keep a farm up and running which can help with work ethic later in life. Try out this game and then more in the Baby Hazel line to teach a young child many different developmental skills.